Ray Taliaferro, the famous king of KGO Radio Late Night, has been reported missing. 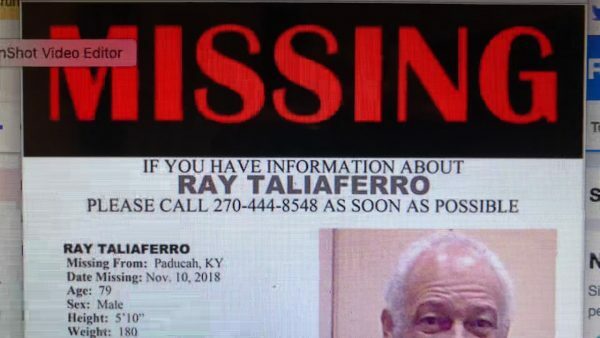 Ray was last seen talking with the manager of a restaurant called The Mellow Mushroom Pizza Restaurant In Paducah, Kentucky. That was 14 days ago on November 10th. According to a tweet, Ray was with his wife and they rented a car. She reported him missing. Ray is 79 years old, 5’10”, 180, thin build, light skinned African American man with grey hair. Paducah Police report he may be experiencing signs of dementia. Ray is one of the most famous black journalists in the history of the San Francisco Bay Area. Any information please call the Paducah Police At 270-444-8548. Be the first to comment on "Ray Taliaferro, Famed KGO Radio Star, Missing In Kentucky – Vlog"